Brooklyn-based jamtronica quartet that weaves composition and improvisation through an ever-changing landscape of segues, inversions, and palindromes. 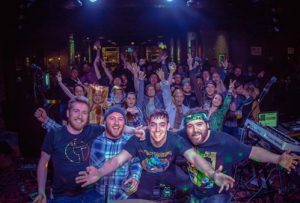 Drawing from an array of inspirations including jam music, electronic production, film scores, and a bit of metal, Space Bacon seeks to challenge conventions and pave the way in the modern era of improvisational music. Horizon Wireless blends psychedelic break-beat & house music with a variety of other styles including trip-hop, minimal tech-funk, and nu-jazz to create smooth, high energy, and soulful dance experiences for the inner alien in us all. Horizon has been on a cosmic roller coaster ride over the past five years… starting with humble beginnings in sorority basement parties and dive bars, and eventually piloting such notable spaceships as The Capitol Theatre, Irving Plaza, The Theater at Madison Square Garden, Electric Factory and many more.